One this show we focused our attention on the town of Banbury Oxfordshire. Tim Tarby-Donald – Also known as Mr Visit Banbury explains his love affair with the town, and what he’s giving back. A fascinating tale of positivity. Tim is looking for Visit Banbury to be the glue which sticks together all of the great positive things happening in and around Banbury and makes everyone aware of them. How people can get involved. How to help in terms of participating, supporting the town and funding! The success of the project, particularly in the early stages, will rely on people getting involved to help in an altruistic way, doing things to support the town and its people as they are passionate about Banbury. Asking the all important searching questions is a brand new guest presenter to the show Neil Wild. In this 1:48 snippet Tim explains where the #VisitBanbury hashtag on Twitter all started. And the hopes and desires for the future. We hear how Tim came to live in Banbury, and actually fall in love with the town. Recently resigned from his European Procurement job at Xerox after nearly 20 years with them and 22 years in Purchasing roles. Has been involved in Community based activities in his street, Queens Road, in Banbury since 2009 via an Eden Project initiative called The Big Lunch and has realised over the last 12 months that he needs to use his business skills in a way which helps people rather than purely for the profit motive. Hence the project called Visit Banbury which is effectively doing what he have done in Queens Rd but on a larger scale. 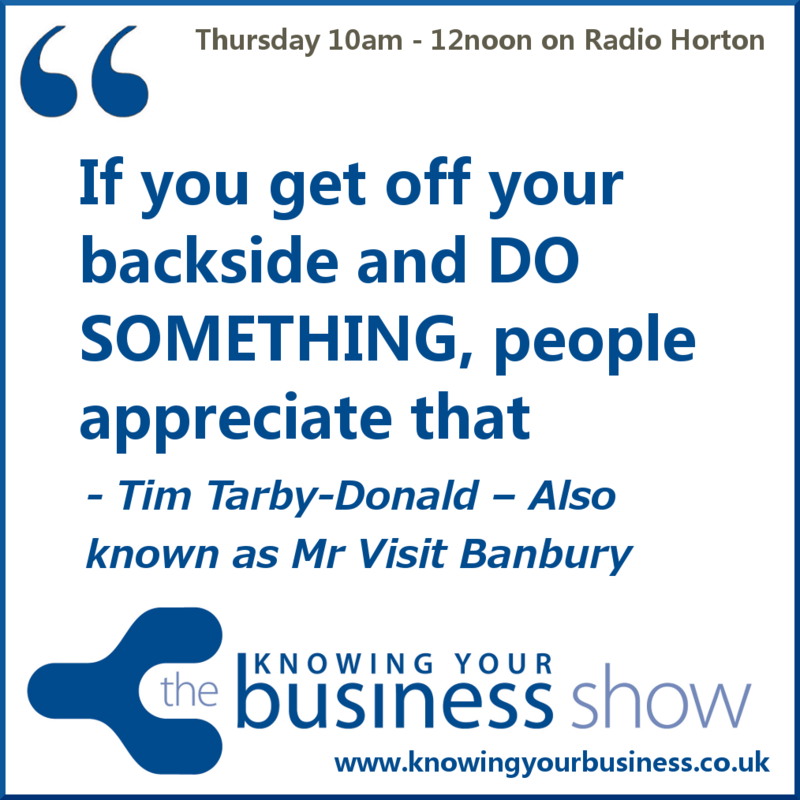 This week the Knowing Your Business show has been presented by Ian Gentles and guest presenter Neil Wild. Qualified Chartered Surveyor with 21 years property experience working initially with large property firm Bidwells and then as a Director of two property investment companies, before setting up his own consultancy practice based in Oxfordshire. The Knowing Your Business Show is broadcast every Thursday at 10 am until 12 pm on Radio Horton. If you have any questions for Tim, or would just like to leave a comment, please do. Great to hear how Tim left a high pressure career to pursue a more rewarding role and that he is happy to talk about it. It is a story repeated by many ex-employees who go it alone, it takes great courage to realise that a job is no longer good for you and resign. Well done. I echo those words Michelle. I am also a fan on the whole Visit Banbury Concept.